When I was a child, I used to play a game called Word Ladders. You may have played this game yourself. In the Word Ladders game, you change one word to another by shifting one letter at a time. What makes the game challenging is that each of the middle steps have to be legitimate words themselves. At the first step, I shifted the "a" to an "o," changing "cat" to "cot." Then I shifted "cot" to "cog" – again, only one letter was changed. Finally, "cog" turned to "dog." As you can see, each of the middle steps was a legitimate word. Word Ladders is a fun game, and can be entertainingly tricky – especially when you are dealing with four- and five-letter words. 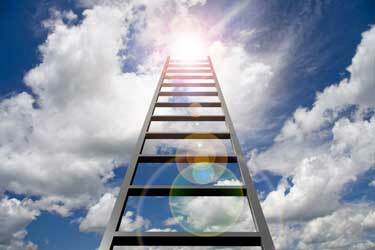 The goal is to complete the ladder in as few steps as possible, though any completion is a success. Let me now share how this game can inspire an approach to spiritual work. For much of my life, I was engaged in what cognitive therapists call "all-or-nothing thinking." The idea was that I either did things perfectly, or I didn't do them at all. For example, let's take a practice like forgiveness. The theme of forgiveness is central to many spiritual and personal growth paths. I knew that it was important. So when I found myself angry and resentful toward someone in my life, I tried to release my hostility. I tried to practice what the spiritual teachings said. Unfortunately, most of the time, I wouldn't be able to take the leap. I'd try to practice forgiveness, but I'd fall right back into anger and resentment. After a few attempts, I'd give up. "I can't do this," I'd say. "I tried to practice forgiveness, but I just couldn't do it." The Climbing the Ladder practice helps at points like that. In Climbing the Ladder, you don't try to take a leap into complete forgiveness, complete peace of mind, or complete anything else. Instead, you take a series of small, slow steps. Just as in the Word Ladders game, in which you change only one letter at a time, Climbing the Ladder involves one small belief-shift at a time. This guy is a total jerk. He's completely insensitive, rude, and mean. In the past, as I mentioned, I'd try to leap from that type of belief into a sense of complete love. But I just couldn't do it! I'd try, and fail, and get frustrated and give up. This guy is mostly a jerk. He's usually insensitive, rude, and mean. This guy is a total jerk. He's completely insensitive, rude, and mean. This guy does act quite insensitive, rude, and mean. Perhaps he's feeling insecure, and that's his way of covering it up. This guy often acts insensitive and rude. He's probably feeling disconnected from people. Perhaps he's feeling lonely and defensive. This guy's insensitivity deserves some compassion. Perhaps I can offer him kindness, which he's not feeling. I have a good deal of compassion and kindness to offer this person. I have so much kindness and love within me. I can simply let it pour out to this person and others. As you can see, the ladder evolved in gradual, progressive steps. There was no great leap. Instead, there was a series of little shifts. When I engage in this practice, I often spend minutes, hours, or days on each step. I wait until I feel truly stable on a particular step before going forward. As a final point, Climbing the Ladder can be used in a variety of other contexts. Let's say, for example, that you want to begin a meditation practice. Instead of trying to take a leap, you can take things in small steps. You can say, for example, "I'm going to meditate for exactly five seconds a day." Spend a couple of days meditating for only five seconds – no more. After a day or two of that, you'll probably say, "Hey, I'd rather meditate for thirty seconds." Then perhaps a minute. Then a few minutes. You can inch along, always waiting until you're truly ready to proceed. Again, this type of practice reduces the tendency toward all-or-nothing thinking, which is a setup for frustration and defeat. I encourage you to experiment with this approach, and see what you find. This article by Dan Joseph originally appeared in the Quiet Mind newsletter. The Quiet Mind newsletter is a free publication that is sent out quarterly by email. In the newsletter, author Dan Joseph shares practices from various spiritual and psychological teachings – including cognitive therapy, A Course in Miracles, and meditation techniques. If you'd like to subscribe to the newsletter, you can click here. Your email address will not be shared, and you can automatically unsubscribe at any time.